Survival and Rescue missions, whether it’s performed by soldiers or search and rescue teams, demand top quality equipment which is not going to fail them in a time of need as someone’s life may depend on it. That is why the SRK (Survival Rescue Knife) was designed to be able to withstand a beating and still remain as a top quality knife. Not only that, it really does look fantastic with its black finish and simplistic handle. For the quality of the knife, it is relatively cheap, coming in at around $130 retail, but if you shop around I am sure you can get it for a cheaper price. I would probably recommend this blade to those who are going on active service because this knife is really going to be a big help in nearly any given situation whilst at the same time not being that expensive. 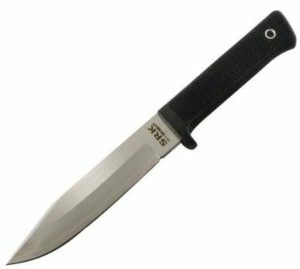 The Cold steel SRK features a fairly long fixed blade coming in at 6″ long. This is one hell of a tough blade as you can tell from the above video as it penetrates everything from Kevlar vests to car bonnets, to magazine clips with ease. This is all thanks to the high-quality Japanese Aus-8a steel which is not only super sharp but also super tough. This means that no matter the beating you give this knife, it is not going to chip or break and is still going to maintain that razor sharp edge. The blade is also coated in a Tuff-Ex coat which protects it from rust and corrosion meaning that even in the harshest climates this knife is not going to erode away like some other fixed blade survival knives on the market. The blade is 3/16″ thick making it relatively thick but at the same time extremely tough and can handle high amounts of stress, which you tell from the above video where it is bent well over 45 degrees. A survival/rescue knife is going to need a tough ergonomic handle which can be operated in a variety of conditions and circumstances, which is exactly what the Cold Steel SRK delivers. The handle sports a Kray-ex grip which no matter the weather or conditions, allows you to get a really solid tight grip. It is relatively thin, which allows you to get a nice grip, however, I would have preferred for it to be slightly thicker, but that is just mainly because I have slightly bigger hands. Overall, the Cold Steel SRK really is a top quality knife that is going to last you a long time. 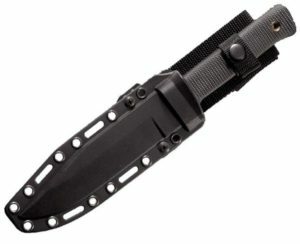 More importantly, it is going to be a knife that you can depend on in tough situations. If you know someone who is going on active service soon, then this is definitely the present I would be giving them, you never know – it could save their life!